The question of how quickly the universe is expanding has been bugging astronomers for almost a century. Different studies keep coming up with different answers—which has some researchers wondering if they've overlooked a key mechanism in the machinery that drives the cosmos. Now, by pioneering a new way to measure how quickly the cosmos is expanding, a team led by UCLA astronomers has taken a step toward resolving the debate. The group's research is published today in Monthly Notices of the Royal Astronomical Society. At the heart of the dispute is the Hubble constant, a number that relates distances to the redshifts of galaxies—the amount that light is stretched as it travels to Earth through the expanding universe. Estimates for the Hubble constant range from about 67 to 73 kilometers per second per megaparsec, meaning that two points in space 1 megaparsec apart (the equivalent of 3.26 million light-years) are racing away from each other at a speed between 67 and 73 kilometers per second. "The Hubble constant anchors the physical scale of the universe," said Simon Birrer, a UCLA postdoctoral scholar and lead author of the study. Without a precise value for the Hubble constant, astronomers can't accurately determine the sizes of remote galaxies, the age of the universe or the expansion history of the cosmos. Most methods for deriving the Hubble constant have two ingredients: a distance to some source of light and that light source's redshift. Looking for a light source that had not been used in other scientists' calculations, Birrer and colleagues turned to quasars, fountains of radiation that are powered by gargantuan black holes. And for their research, the scientists chose one specific subset of quasars—those whose light has been bent by the gravity of an intervening galaxy, which produces two side-by-side images of the quasar on the sky. Light from the two images takes different routes to Earth. When the quasar's brightness fluctuates, the two images flicker one after another, rather than at the same time. The delay in time between those two flickers, along with information about the meddling galaxy's gravitational field, can be used to trace the light's journey and deduce the distances from Earth to both the quasar and the foreground galaxy. Knowing the redshifts of the quasar and galaxy enabled the scientists to estimate how quickly the universe is expanding. The UCLA team, as part of the international H0liCOW collaboration, had previously applied the technique to study quadruply imaged quasars, in which four images of a quasar appear around a foreground galaxy. 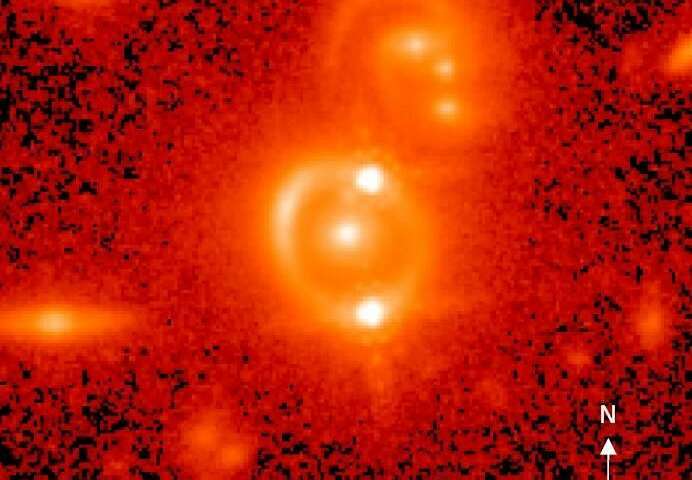 But quadruple images are not nearly as common—double-image quasars are thought to be about five times as abundant as the quadruple ones. To demonstrate the technique, the UCLA-led team studied a doubly imaged quasar known as SDSS J1206+4332; they relied on data from the Hubble Space Telescope, the Gemini and W.M. Keck observatories, and from the Cosmological Monitoring of Gravitational Lenses, or COSMOGRAIL, network—a program managed by Switzerland's Ecole Polytechnique Federale de Lausanne that is aimed at determining the Hubble constant. Tommaso Treu, a UCLA professor of physics and astronomy and the paper's senior author, said the researchers took images of the quasar every day for several years to precisely measure the time delay between the images. Then, to get the best estimate possible of the Hubble constant, they combined the data gathered on that quasar with data that had previously been gathered by their H0liCOW collaboration on three quadruply imaged quasars. "The beauty of this measurement is that it's highly complementary to and independent of others," Treu said. The UCLA-led team came up with an estimate for the Hubble constant of about 72.5 kilometers per second per megaparsec, a figure in line with what other scientists had determined in research that used distances to supernovas—exploding stars in remote galaxies—as the key measurement. However, both estimates are about 8 percent higher than one that relies on a faint glow from all over the sky called the cosmic microwave background, a relic from 380,000 years after the Big Bang, when light traveled freely through space for the first time. "If there is an actual difference between those values, it means the universe is a little more complicated," Treu said. On the other hand, Treu said, it could also be that one measurement—or all three—are wrong. Those lenses are local (z ~1), so consistency with local Hubble - the supernova data - is not extraordinary though of course of import if robust. Their individual spread is 20 % at 10 % precision, so it is mostly the posterior distribution that makes some sense. As the saying goes, "we need more data". maybe im not getting something but i find it strange that they would even try to present a hubble number from this single case. galaxies almost assuredly will have their own, possibly high velocities separate from that of expanding space but mixed into the redshift regardless. i know theyre continuing research with other cases but for me the question remains how to get an exact number ever when each and every galaxy could be moving in an unknown direction at an unknown velocity within its own space? and would they have to average all the cases together without ever being able to claim exact results? @peabody, it sure tells what the Hubble constant is in that direction. More data is more data; we'll have to see what they find when they check them all. im not sure you caught my meaning. how does it show the hubble constant in that direction, as you say, if the remote galaxy itself is moving within its own space hundreds of kilometers per second, thereby substantially altering its redshift? Hundreds of km/s? That's nothing. This thing is gravitationally lensed. It's a very long way away. M90...............58.7 ± 2.8 Mly..........−282 ± 4 km/s………. (58,7 x H c = -282 km/s)"
+ "compiled a list of 65 galaxies in Virgo with VLG < 0 (blue shift). Distance 53.8 ± 0.3 Mly (16.5 ± 0.1 Mpc)"
Who lies? Autor or evidence? In the translations: a person who talks without a background (evidence) or scientific evidence? Object with red shift. 5.47 is faster than objects with red shift 7.05 and 11.09 ha, ha. Authors Hubble constant really need to go back to elementary school and learn math (basic for kids). We barely have the capability of collecting the data needed to begin to state how uncertain our conclusions are. Going to take some major developments in sophisticated (i.e very. expensive) technology. To produce more accurate collections of evidence. & even then I suspect, we will have to make choices between conflicting proofs. Am I missing something here? IF astronomers know the distance to a galaxy AND its redshift, wouldn't measuring the increase in that redshift over time tell us how much its' distance is increasing? The same goes for measuring a change in the apparent magnitude of galaxies or their apparent diameters. The thing missing here is that I have not found an answer to your great question. If anyone knows of anyone trying to do what you suggest, I'd like to see it. All the papers I've ever seen only do a great amount of work to relate the cosmic redshift to a distance for the galaxy or star. Then they do a great "leap", an assumption, that it represents a radial velocity. I have not seen any evidence for a change in radial distance. More locally they can measure blueshifts and redshifts for binary stars, rotating spiral galaxies if they are on a certain plane wrt to us.. But this is simply logical since we can see that its an object that rotates. @peabody, please look up the amount of Doppler difference a few hundred km/s makes. Then tell me how z=1.0 compares to that. This isn't about minute changes in the positions of spectra. It's about what normally are visual spectra being shifted into high ulltraviolet or X-ray. I too can find no evidence - empirical measurements - that redshift equates to radial velocity. I have been shocked and saddened by the poor reasoning and vigor of people who call themselves scientists since I realized these measurements don't exist. Are you aware of Hilton Ratcliffe? All examples are of 10 megaparsecs(Mpc) or more. "..Hubble´s law. Indeed: "Objects observed in deep space - extragalactic space, 10 megaparsecs(Mpc) or more - are found to have a red shift, interpreted as a relative velocity away from Earth;". It means that if 10 Mpc equals 32,6 millions of light-years then Hubble's law doesn't apply for galaxies and objects, the values of which are more easily determined. Let's check that on the distances at which Hubble's law should apply: "
maybe im not getting something but i find it strange that they would even try to present a hubble number from this single case.... and would they have to average all the cases together without ever being able to claim exact results? You may want to read the paper; by adding a new case to three earlier - and using bayesian statistics for "averaging" - they got one number. My main beef is that the statistics is still shaky. I am not sure I understand your concern about only using redshift, since it is the cosmological redshift they are interested in and at those distances the small peculiar velocities of ~ 100 km/s are swamped: I get that z ~ 1 corresponds to a recessional velocity of 60 % of c or ~ 200 000 km/s [ https://en.wikipe...Redshift ]. I dunno where you lift those numbers without a reference, but they look like resolved peculiar velocities. See my example based on the observations of the paper, you numbers are far too small. Please always give references, or the discussion becomes futile. All the papers I've ever seen only do a great amount of work to relate the cosmic redshift to a distance for the galaxy or star. Then they do a great "leap", an assumption, that it represents a radial velocity.
? It is not a leap but a known fact - since it is general, increasing with increasing distance et cetera. If you want to explain those observations differently - and people have tried for almost a century now - it does not work (read the literature). But your first comment seems to say you don't grok the physics or scales involved. To see change in redshift rates at z ~ 1 you would have to wait some 10,000 years! To see change in redshift rates at z ~ 1 you would have to wait some 10,000 years! S what about a measured change in redshift at z much greater than 1? What about a measured change in apparent luminosity, or apparent diameter? Or which other measurements are there which show that galaxies are moving apart over time? I was also shocked to notice this same thing a couple of years ago. Then again, I usually prefer actual observations over mathematical mumbo jumbo. I was not familiar with Hilton Ratcliffe. But I have found a whole host of other dissenting astronomers that share his views. They even have their own conferences. They've had two and are collecting papers for a third. Its the "Crisis in Cosmology Conference". Ok. Where is the proof? Show one observation, described somewhere, that shows that the cosmic redshift equates to a radial velocity. @arcmetal I am familiar with those links, thanks. @jonesdave And yet you cannot post a link to any empirical measurements which show that galaxies are increasing their distance apart over time.